Greetings from the ramparts of the Red Fort on the auspicious occasion of Independence Day. Nation is celebrating the Independence Day with the festival of Janamashtmi today . I can see a number of Bal Kanahiyas here. We are fortunate to have in our cultural and historical heritage from a Sudarshan Chakradhari Mohan to Charkhadhari Mohan. From the ramparts of Red Fort, on behalf of our 125 crore countrymen, I bow and pay respects to all those men and women who have sacrificed their lives, who have undergone immense sufferings and made sacrifices for the independence, glory and pride of the country. Sometimes, natural calamities are a big challenge for us. A good monsoon contributes immensely to the prosperity of the country. However, due to climate change, sometimes it turns into a natural calamity. Several parts of the country faced natural calamities recently. Besides our innocent children lost their lives in a hospital. Our 125 crore countrymen stand shoulder to shoulder with them in this hour of crisis and grief. I assure the countrymen that in this hour of crisis we shall leave no stone unturned to ensure the wellbeing of all. My dear countrymen, this year is a special year for independent India. We commemorated 75 years of Quit India Movement last week. This year we are also commemorating the centenary of Champaran Satyagrah and the Sabarmati Ashram. The centenary of Lokmanya Tilak’s call “Swaraj is my birth right” falls this year as well. The year marks the 125th Anniversary of the Ganesh Utsav which led to the rise of community awakening through the celebrations. It inspires us to dedicate ourselves to a cause for the country. A collective resolve of the citizens was visible during 1942 to 1947 across the country which forced the British to Quit India within a span of five years. We will have to exhibit the same resolve from now on in the 70th year of independence to 2022, the 75th year of independence. We now have five years before we reach the 75th year of our independence. Our united resolve, strength and determination to work hard remembering the memory of our great patriots will help us to build an India of their dreams by 2022. Therefore, we have to take the country forward with a pledge to build a New India. We are aware of the power of the collective resolve, hard work, sacrifice and devotion of our 125 crore citizens. Lord Krishna was immensely powerful, but it is only when the milkmen came out with sticks in his support that they could lift the Govardhan parvat. When Lord Rama had to go to Lanka, the monkeys of vanar sena came to his help, Ramsetu was built and Lord Rama could reach Lanka. Then there was Mohandas Karamchand Gandhi, who empowered his countrymen to weave the fabric of independence with cotton and spinning wheel. The collective resolve and strength of the people got freedom for our country. No one is small or big. We have in our memory the story of squirrel which became an agent of change. That’s why we must remember that no one among the 1.25 billion people is either small or big – everyone is equal. If each one of us, irrespective of where he belongs to, strives with a new resolve, a new energy, a new strength, we can change the face of the country with our combined strength in the 75th year of our independence in 2022. It will be the New India – a secure, prosperous and strong nation. A New India where there is equal opportunity for all; where modern science and technology play an important role in bringing glory for the nation in the global arena. Our freedom movement is linked to our sentiments. We know it well that at the time of the freedom movement, the teacher who was engaged in teaching, the farmer who was tilling his land, the laborer who was working – all of them knew in their hearts that whatever they were doing, was contributing towards the independence of the country. This idea is a great source of strength. In the family, food is prepared everyday but it becomes ‘prasad’ only when it is offered to the deity. We are working, but if we do so in the spirit of working for the glory of mother India, for the divinity of mother India, if we do it to rid our countrymen of poverty, if we do it to properly weave our social fabric, if we discharge our duties with feelings towards the country, if we do it with a sense of devotion to country, if we do our work by dedicating it to the country, then the achievements will be much more. That is why we should move forward with this spirit. January 1, 2018 will not be an ordinary day – those born in this century will start turning 18. For these people, this is a decisive year of their lives. They are going to be the creator of the destiny (Bhagya Vidhata) of our nation in the 21st century. I heartily welcome all these youth, honour them and offer my respects to them. You have an opportunity to shape the destiny of our country. A proud nation invites you to become a part of its developmental journey. When Arjuna was posing a lot of queries to Lord Krishna in the battlefield of Kurukshetra, then Krishna told Arjuna that you achieve goals as per your thinking and beliefs. We have a strong determination, we are committed for a brighter India. We, who have grown up with a state of hopelessness, have to reject the feeling of despair and must now march ahead with confidence. We have to leave this ‘Chalta Hai’ attitude. We have to think of ‘Badal Sakta Hai’- this attitude will help us as a nation. We should have this confidence that with sacrifice and hard work and a resolve to do something, we will get necessary resources and the ability to do it and then a big transformation will happen, and our resolve will convert into accomplishment. It is natural for our countrymen to think of our safety and security. Our country, our military, our brave-hearts, our uniformed forces, be it any force, not just the army, air force or navy, all the uniformed forces, whenever they were called upon to do so, they showed their valour, their strength; our brave-hearts never turned their back in making the supreme sacrifice. Be it Left-Wing-Extremism, be it terrorism, be it infiltrators, be it the elements fomenting trouble inside our country- the uniformed forces of our country have made extreme sacrifices. And when the surgical strike was carried out, then the world had to acknowledge India’s capability and strength. India’s security is our priority. Be it our coast line or our borders, the space or the cyberspace, India is capable of ensuring its own security and strong enough to ward off any threats against the country. Those who have looted the nation and looted the poor are not able to sleep peacefully today. Due to this, the confidence of the hardworking and honest person is increasing. An honest man now feels that his honesty matters. Today, we are celebrating a festival of honesty and there is no place for dishonesty. This gives us new hope. The law against Benami property was lying in limbo for years. Now, we have come up with a law against Benami Property. In such a short time, the government has confiscated Benami properties worth over Rs.800 crores. When these things happen, the common man develops faith that the country is for the honest persons. The ‘One Rank – One Pension’ policy for our defence forces was stuck up for 30-40 years. Our government implemented it. When we fulfill the aspirations of our soldiers, then their morale goes high and their resolve to protect the nation grows manifold. The country has many states and a Central Government. GST has shown the spirit of cooperative federalism and has given competitive cooperative federalism a new strength. The success of GST can be attributed to the hard work that has been put in to make it a success. Technology has made it look like a miracle. The global community is surprised how we were able to roll out GST in such a short time. It is a reflection of our capability and helps in building the confidence and faith of the future generations. New systems are emerging. Today roads are being built at twice the speed. The railway tracks are being laid at double the speed. More than 14 thousand villages that were hitherto shrouded in darkness even after Independence, have been provided with electricity. Bank accounts of 29 crore people have been opened, more than 9 crore farmers have got Soil Health Card. More than 2 crore poor mothers and sisters are no longer using the fuel wood and using LPG gas stove NOW. The poor tribals have gained faith in the system. The person at the last mile of development now joins the mainstream and the nation is marching ahead. More than 8 crore loans have been sanctioned without guarantee to the youth for self-employment. The interest on bank loans have been lowered. Inflation is under control. If a person belonging to the middle-class wants to build his house, then he gets a loan at a lower rate of interest. In this way, the country is moving forward and people are joining the movement. The times have changed. The government is determined to do all it says, like doing away with the interview process. In the labour sector alone, even a small businessman had to fill up to 50-60 forms, but we have now made it more convenient by reducing it to just 5-6 forms. I can provide many such instances of Good Governance, simplifying the process of Governance. By reiterating this we have enforced faster decision making. And that is why 125 crore countrymen have been able to repose faith in our governance. India today has gained in stature across the globe. You will be happy to know that we are not alone in our fight against terrorism. Many nations are proactively supporting us. Be it Hawala, or any inputs related to terrorism, the global community is supporting us with critical information. We have joined hands with other nations in the combined fight against terrorism. I extend my heartfelt greetings to all those countries who are standing in solidarity with us and acknowledge our prowess. For the development and progress of Jammu & Kashmir, its prosperity, and fulfilment of the aspirations of the citizens, not only the J&K government, but we as responsible citizens also have a responsibility. We are committed to restore the state to its former glory so as to experience the paradise that it was, once again. On Kashmir there is rhetoric and politics. But I am clear in my belief on how to win the war against separatism, which is spread by a handful of people. The problem will be solved neither by abuse or bullets – it will be solved by embracing all Kashmiris. Such is the legacy of 125 crore Indians. Hence, neither by abuse nor by bullets, change will come by embracing all. And we are moving forward with this resolve. We shall take strict steps against terrorism. There is no question of being soft on terrorism or terrorists. We have been asking the extremists to join the mainstream. Democracy provides an equal opportunity and rights to be heard for all. The process of engagement can take place only by their joining the mainstream. I deeply appreciate the efforts of security forces in curbing the Left Wing extremism which mobilized a lot of youth from these regions to surrender and joined the mainstream. Security forces are keeping a tight vigil on our borders. I am delighted to announce that today the Indian Government is launching a website which will give an account of the valour of the Gallantry Award winners. A portal is also being launched which aims to provide the entire details of these brave hearts who have brought pride to the nation. The story of sacrifices made will certainly inspire the younger generations. With the help of technology, we are trying to promote honesty and transparency in the country. Our fight against black money will continue; our fight against corruption will continue. With the intervention of technology, slowly we are trying to link Aadhaar with the system. We have been successful in infusing transparency in the system. People from around the world have appreciated this model and have been studying it. A common man living thousands of kilometres away can now supply his products to the Government. He doesn’t need any middle man. We have launched a portal called “GEM”. The Government is making procurement through this portal. We have been successful in bringing transparency at various levels. Implementation of Government schemes are gaining momentum. When a work is delayed, it is not only the project that is delayed. It is not a matter of expenditure of money. When a work is stalled, the poor families are the ones who suffer the most. We can reach the planet Mars within 9 months; we are capable of achieving that. I review Government Projects every month. A specific project came to my notice. It was a 42-year old project. 70-72 kilometres of Railway lines were to be laid, but the project was lying in limbo for the last 42 years. When a country that is capable of reaching Mars within 9 months, how is it possible that it is not able to lay 70-72 Kilometres railway lines for 42 long years. It sets in doubts in the minds of the poor. We have taken care of all these things. We have been striving to bring in the changes through technology. Whether it is Geo-Technology or Space-Technology, we have tried to link all these technologies to bring in transformation. You must have seen that there was a time when tension prevailed between the Centre and the States for Urea and Kerosene. The Centre was like an elder brother while the State was treated like a younger brother. I have been a Chief Minister for a long time and I know the importance of states in the development of the country. I know the importance of the Chief Ministers and the State Governments. Hence , we laid emphasis on Co-operative Federalism. Now we are moving towards a Competitive Co-operative Federalism. You must have seen that we are taking all the decisions together. 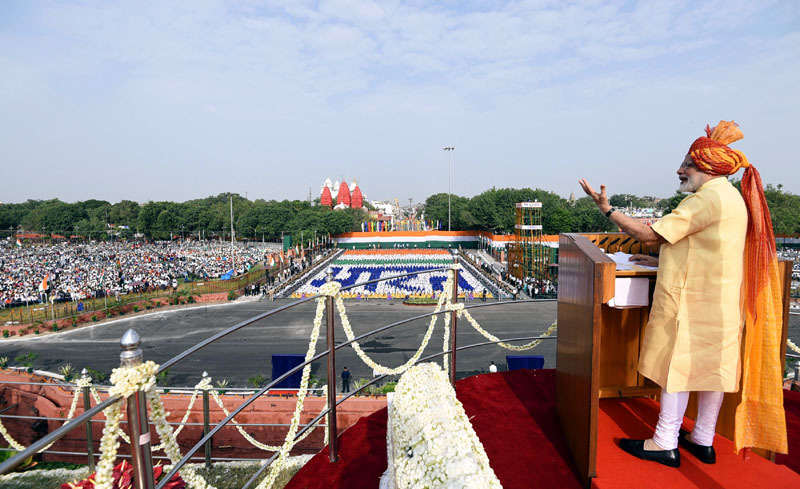 You may recall that one of our Prime Ministers in his address from the ramparts of Red Fort had talked about the poor state of affairs of the power supply companies of the country. He expressed his concerns over the issue. Today with the “UDAY” Yojana, we have worked together to resolve the issues with these power companies. It is a concrete example of federalism in its real sense. Whether it is GST or Smart City Project, whether it is Swachh Bharat Abhiyan, or construction of toilets, or ease of doing business, all these are being accomplished by working together shoulder to shoulder with the States. In the New India, the biggest strength is democracy. But we have reduced our democracy to mere ballot boxes. However, democracy cannot be confined only to ballot boxes. Hence our resolve is to see to it that we have a democracy in New India, where people are not driven by the system, rather the system is driven by the people. Such a democracy should become the identity of New India and we want to move towards that direction. Lokmanya Tilak Ji had said “Swaraj is my birthright”. In Independent India our Mantra should be “Good Governance is my birthright”. ‘Suraja’ or Good Governance should be our collective responsibility. The citizens should fulfil their duties and the Government too should discharge its responsibilities. When we move from “Swaraj” to “Suraja”, the citizens do not lag behind. For example, when I called upon the countrymen to give up gas subsidy, the nation responded as a whole. I have spoken about cleanliness. Now people are joining hands from every part of the country to take up this cleanliness drive forward. When demonetization was announced, the world was surprised. People thought that this was the end of Modi. But the way our 125 crore countrymen had shown patience and faith, we were able to take one after another step in our drive against corruption. With this new practice of people’s participation, our effort to take the country forward with people’s involvement will help us to reach our goal. Lal Bahadur Shastri had given the slogan “Jai Jawan Jai Kisan.” Our farmers have not looked back since then. They are now producing record harvests and scaling new heights despite facing natural adversities. There has been a record production of pulses this year. India never had the tradition to import pulses and if it had to import on rare occasions, it was only a few thousand tons. This year when they produced 16 lakh tons of pulses to provide nutrition to the poor, the government took the historic step of encouraging them by buying their produce. Pradhan Mantri Fasal Bima Yojna has provided a security cover to our farmers. Three years back, this scheme which was running under a different name earlier, covered only 3.25 crore farmers. Now over a short span of three years more farmers have been brought under its ambit. The number is soon going to touch the 5.75 crore mark. Pradhan Mantri Krishi Sinchai Yojna aims to meet the demand of water of the farmers. If my farmers get water, they can produce rich harvests from their fields. 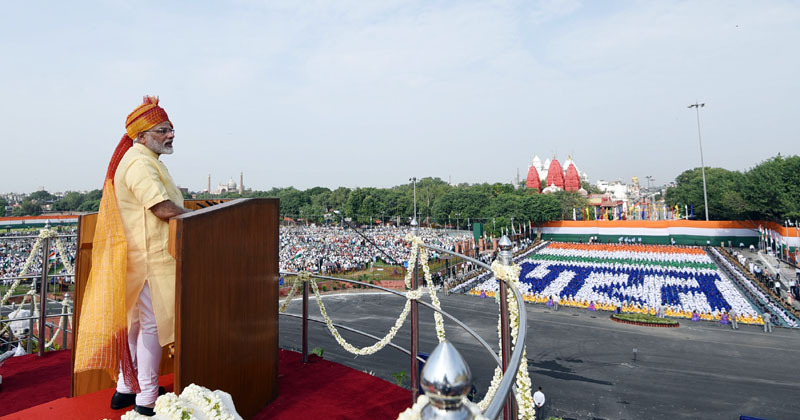 That is why I had made some announcements from the ramparts of Red Fort on the last Independence Day. Out of those, we have completed 21 projects and remaining 50 would be completed soon. I have resolved to complete 99 big projects. By completing those 99 big projects before 2019, we shall fulfill our commitment. We cannot change the lot of our farmers until we hand hold him from procuring seeds to ensure that his produce reaches the market. For this we need infrastructure and supply chain. Every year vegetables, fruits and grains worth lakhs of crores of rupees are wasted. In order to change the situation, the government has encouraged Foreign Direct Investment in food processing sector. Government of India has launched ‘Pradhan Mantri Kisan Sampada Yojna’ to encourage infrastructure building. Due to this, systems shall be put in place that will ensure hand-holding of the farmers from supplying seeds to marketing his produce. Such arrangements will usher in a new change in the lives of crores of our farmers. With the changes in demand and technology, the nature of jobs in our country has been changing. The Government has launched several new initiatives in the employment related schemes and also in the manner in which the training is imparted for the development of human resource according to the needs of the 21st century. We have launched a massive program to provide collateral free loans to the youth. Our youth should become independent, he should get the employment, he should become the provider of employment. Over the past three years, ‘Pradhanmantri Mudra Yojana’ has led to millions and millions of youth becoming self-dependent. It’s not just that, one youth is providing employment to one, two or three more people. In the education sector, we have taken an important step to grant the universities freedom from restrictions to make them the world class universities. We have asked 20 universities to decide their own destiny. The government will not interfere in their functioning. Besides, the government is willing to provide funds up to Rs. 1,000 crores. We have appealed to them and I am confident that the education institutions of our country will certainly come forward and make it a success. Over the last three years, we have set up 6 IITs, 7 new IIMs and 8 new IIITs and we have also done the groundwork for linking the education with job opportunities. My mothers and sisters, the women in the families seek employment in large numbers. And therefore we have taken a very important step to reform the labour laws to provide them the employment opportunities in the night also. Our mothers and sisters are an integral unit of our families. Their contribution in making our future is extremely important. And that is why we have decided to increase the paid maternity leave to 26 weeks from the earlier 12 weeks. In the context of women empowerment, I’d like to honour those sisters who have been forced to lead a very difficult life due to ‘Triple Talaq’. There is no recourse for them, and such victims of ‘Triple Talaq’ have launched a massive movement in the country. They shook the conscience of the intellectual class of the country, the media of the country also helped them and a movement against ‘Triple Talaq’ was started in the country. I heartily commend those sisters who have launched this movement, who have been fighting against the ‘Triple Talaq’ and I’m confident that the country will help them in this struggle. The country will help these mothers and sisters in securing this right. India will fully support them and they will ultimately achieve success in this very important step in the direction of women empowerment; I am fully confident about this. Sometimes in the name of faith, some people due to lack of patience end up destroying the social fabric. The country is governed by peace, harmony and unity. The poison of casteism and communalism can never benefit the country. This is the land of Gandhi and Buddha, we have to move forward taking everyone along. This is a part of our country’s culture and tradition. We have to successfully carry it forward, and that is why in the name of faith, violence cannot be allowed. If something happens to a patient in a hospital and the hospital is burnt down; some accident happens and the vehicles are burnt down; people launch a movement and the public property is burnt down; is it for a free India? It is the property of 125 crore Indians. Whose cultural legacy is this? This is our cultural legacy, the legacy of 125 crore people. Whose faith is this? This is our faith, the faith of 125 crore people; and that is why the path of violence in the name of faith can never succeed in this country. The country will never accept this. And that is why I’d like to appeal to all the countrymen that at that time our motto was ‘Bharat Chodo’ and today’s slogan is ‘Bharat Jodo’. We have to take everyone and every section of the society along to take the country forward. In order to build a prosperous India, we need a strong economy, balanced development and next generation infrastructure. Only then, we can realise the India of our dreams. We have taken innumerable decisions over the past three years. Some have been noticed, while the rest may not have been noticed. But one thing is important – when you move towards big changes, you will face hurdles. But look at the working style of this government; when a train crosses a railway station and changes the track, the speed needs to be reduced from 60 to 30. The speed of the train decreases while changing the track. We are trying to put the whole country on a new track without decreasing the speed. We have maintained the speed. We may have brought a number of new laws and systems such as the GST, but we have successfully accomplished the task and the work goes on. We have laid emphasis on infrastructure. We have invested lot of funds for building the infrastructure – from modernization of the railway station in a small town, to build an Airport, to expand water-ways or roadways, to form a gas-grid or a water-grid or to lay down an optical fibre network. We are emphasising on all types of modern infrastructure. The prosperity of Eastern India is required for India’s forward movement into the 21st century. It has tremendous potential, rich human resources, immense natural wealth, work force and it has the power to change lives. We are devoting significant attention to eastern India- Bihar, Assam, West Bengal, Odisha, and the Northeast. These parts have to grow further. These are abundant in natural resources and are striving hard to take the country to new heights. Making India corruption-free is an important task and we are trying to provide impetus to it. After forming the government, our first task was to constitute an SIT. Today, after three years, I want to tell the countrymen proudly that we have confiscated black money worth Rs. 1.25 lakh crores, the culprits would be brought to book and forced to surrender. Demonetization followed this move. We have achieved several milestones through demonetization. The hidden black money has been brought into the formal economy. You must have seen that we used to extend the days from 7 days to 10 days to 15 days; sometimes we allowed the old notes at the petrol pump, at the chemist shops, and sometimes at the railway stations, because our intention was to bring all money into the formal banking system and we achieved success in completing the task. According to the research conducted by outside experts, about Rs.3 lakh crores that had never come into the banking system before, has been brought into the system after the demonetization. More than Rs. 1.75 lakh crores deposited in the banks is under the scanner. Black money worth Rs. 2 lakh crore had to be deposited in the banks and this system has forced them to be accountable. It has also stopped the flow of black money. The number of new taxpayers filing income tax returns from April 01 to August 05 is 56 lakhs while in the same period last year only 22 lakh filed the returns.. In a way it has more than doubled. This is the result of our fight against black money. Over 18 lakh people have been identified, whose income is much higher than what their declared income and therefore they have to clarify this. Around 4.5 lakh people have now come forward and are trying to trade the right path after accepting their mistakes. One lakh people, who had neither heard of Income Tax nor paid Income Tax, have now been forced to do so. In our country, we tend to indulge in endless debates and discussions following the shutdown of companies. People start speculating about economic meltdown and what not. You will be surprised to know that black marketers used to own shell companies. Post demonetization, the reports from data mining astonishingly revealed that there are 3 lakh shell companies dealing in Hawala transactions. Can anyone imagine? Out of these 3 lakh shell companies, registration of 1.75 lakh companies were cancelled. Even if five companies shut shop in India, there is huge public outcry. And here, we have closed one lakh Seventy five thousand companies. The looters of nation’s wealth will have to answer. We have accomplished this task. You will be surprised to know that there are some shell companies operating from a single address. As many as 400 companies have been found to be operating from one address. There was no one to question them. There was a total collusion. Therefore, Brothers and sisters, I have waged a big war against corruption and black money. 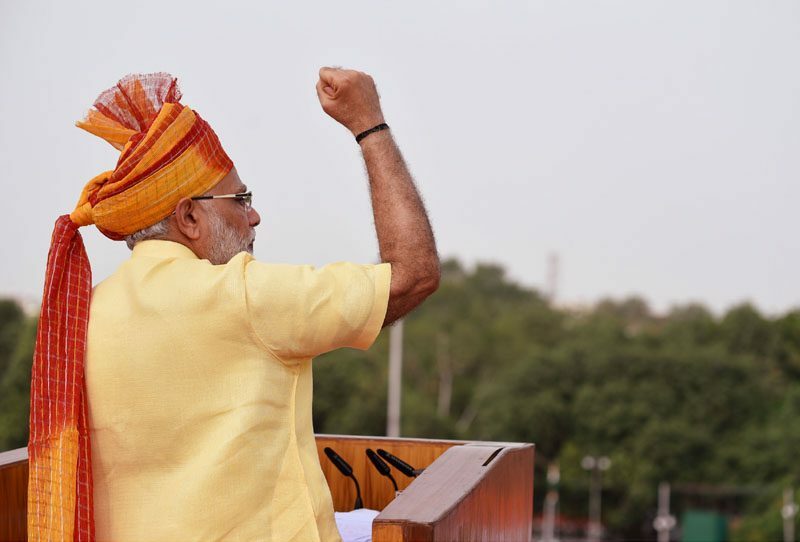 We are fighting corruption – for the bright future of India and the wellbeing of our people. We have taken several steps and I am sure that post GST, it will increase further and bring in transparency. Today a truck driver on an average is able to save 30% of his travel time from one point to another after GST was introduced. Hundreds of crores of rupees have been saved due to removal of check posts. This amounts to 30% increase in his efficiency. Can you imagine what it means to accomplish 30% more efficiency in the Indian transportation sector? GST has brought this revolutionary change. Today due to demonetization, banks have enough liquidity. Banks are reducing their interest rates. Even a common man is able to access inflow of funds through Mudra. He is getting opportunities to stand on his feet. The middle class and the underprivileged who aspire to have their own homes someday, are getting loans from the banks at low interest rates. Such moves are giving a fillip to the economic growth of the country. Time has changed. We are in the 21st Century. Our country boasts of the world’s largest youth population. India is known in the world for its prowess in IT and Digital World. Should we still remain in the old mind-set? There was a time when leather coins were in vogue, but gradually they ceased to exist. Today we have paper-currency. Slowly this paper-currency will be replaced by the digital currency. We should lead from the front to make a move towards Digital transactions. We should adopt BHIM App for transactions and make it a part of our economic activities. We should also work through prepaid systems. I am happy that there has been an increase in Digital transactions. It has increased by 34% compared to last year while the prepaid transactions have gone up by 44%. We should move towards a less-cash economy. My Dear Countrymen, some schemes of the Government are meant for ensuring savings for the common man. If you use LED bulbs, you can save Rs.2000 to Rs. 5000 per year. If we succeed in Swachh Bharat, poor will be able to save Rs. 7000 on medicines that they would otherwise have spent. Curbing inflation has helped people in saving money in a way. Cheap medicines through Jan Aushadhi Kendras are a boon to the poor. There used to be a lot of expenditure on operations and stents. We are striving to make it possible for knee operations as well. We are striving to minimize this expenditure for the poor and the middle class. Earlier there used to be Dialysis only at the State capitals. Now we have decided to open Dialysis Centres at district level. We have already opened this facility in 350 to 400 districts where free Dialysis services are available for the poor. We can take pride in the fact that we have developed various systems to showcase to the world. We have been able to develop the ‘NAVIC Navigation System’ through GPS. We have helped the neighbouring countries by successfully launching SAARC Satellite. We asserted our supremacy in the world by introducing Tejas aircraft. BHIM Aadhaar App for digital transaction has come as a surprise to the world. Crores of RuPay Cards are now available in the country. When all the cards will be operational, it will be the largest number of cards in the world. My dear countrymen, I shall urge you to take up the New India Pledge and move ahead. Our scriptures say, “अनियत काल:, अनियत कालः प्रभुत्यो विपलवन्ते, प्रभुत्यो विपलवन्ते”. It implies that, if we don’t accomplish a work within the stipulated time then we shall not be able to get the desired results. So for the ‘Team India’, for the 125 crore countrymen, we have to take the pledge to achieve the goal by 2022. We will do it with dedication to see a great, majestic India by 2022. So we will together build such an India where the poor will have Pucca House with electricity and water. Together we will build such an India where the farmers can sleep without worry. They will earn double by 2022 of what they are earning today. Together we will build such an India where the youth, the women will have enough opportunities to fulfil their dreams. Together we will build such an India which will be free from terrorism, communalism and casteism. Together we will build such an India where nobody will compromise with corruption and nepotism. Together we will build such an India which will be clean and healthy, and where the dream of Su-Raj will be fulfilled. And that is why my dear fellow countrymen, we will together strive to move ahead in this march towards development. Let all of us march together with the dream of a building an India of grandeur and majesty as we wait for the 75th year of independence after completing 70 years of Independence in the next five years. With this thought in mind I once again bow my head before the heroes of our freedom movement. I bow my head before the new confidence and passion of my 125 crore countrymen and I call upon Team India to march on with this new pledge. With this thought I convey my hearty congratulations to all of you.